In the 20th century the art world goes through some very radical changes and what becomes the most important distinguishing characteristic for most artists has to do with the physical qualities of the work. In the case of Constantin Brancusi there are a number of hallmarks or main qualities that are important in all of his works. 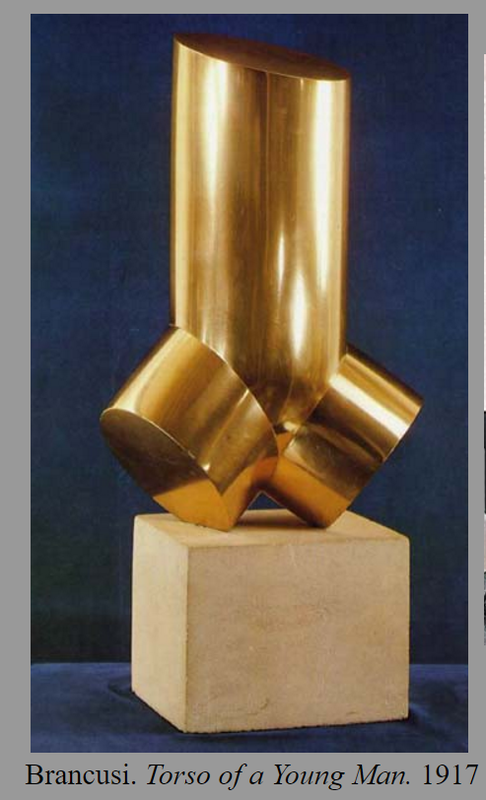 The first quality and Brancusi’s work that someone studying art history should know is that the work is semi-abstract. 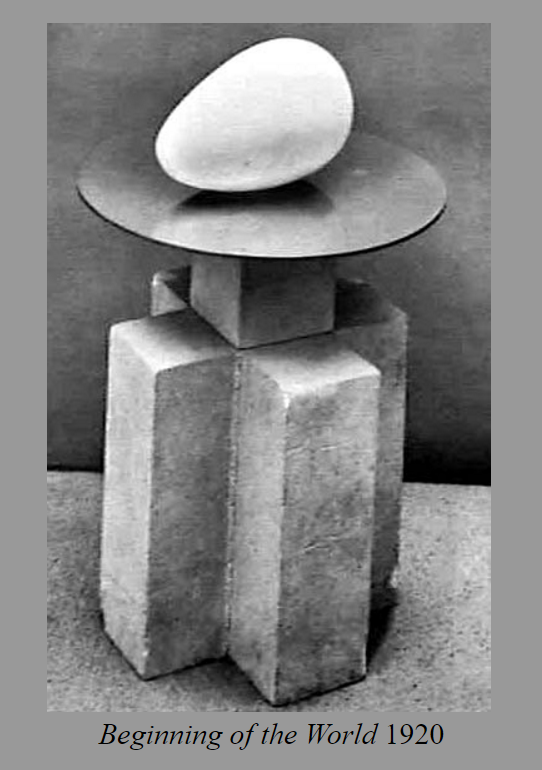 It represents something, usually stated in the title of the work, but Brancusi takes what he’s representing and boils it down into simple geometric forms. 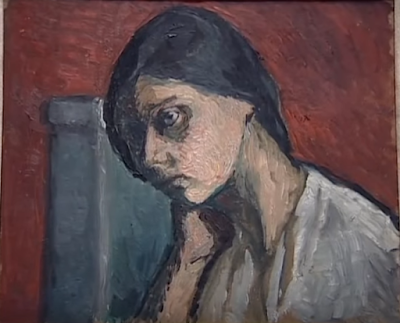 A portrait of someone such as Mademoiselle Pogany will start with an egg shape that looks rather like a head but will also be stylized and abstracted down almost into a cartoon of what the portrait is supposed to portray. 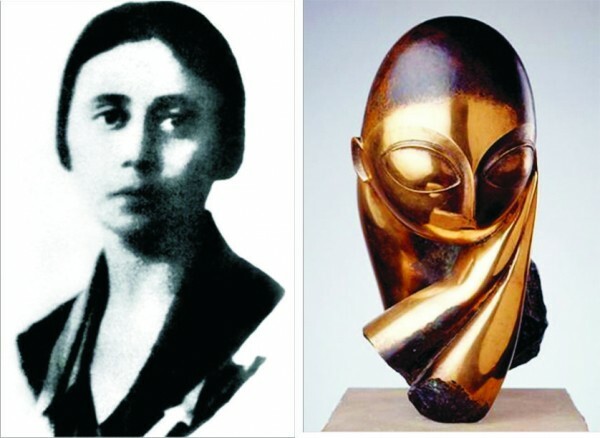 Interestingly enough you can tell that Brancusi’s portrait of Pogany when compared to her painting which is a self-portrait is surprisingly close to the pose and her appearance. One of the next qualities in a majority of Brancusi’s works is that Brancusi tends to mix materials together. For example, Brancusi sculpture “bird In Space,” from 1919 incorporates a stand or platform made out of concrete or some other stone. Above that is a polished bronze form that looks a little bit like a teardrop or a wing from an airplane. He is combining bronze and stone and also incorporates a platform or column underneath the work. Several of the things about Brancusi’s work also is that she is abstraction is part of the main concepts behind his work. Brancusi felt that sculpture was a very tactile kind of medium and should be physically interesting in terms of its textures and materials. He also believed that the base on which the sculpture sat was part of the entire piece and in the same way that many artists want to control the experience of how their work is perceived Brancusi incorporates the way in which the sculpture is exhibited as part of the sculpture. Another important element for Brancusi, which probably relates somewhat to recent psychoanalytic theory that was being developed by Sigmund Freud and Carl Jung, are the ideas behind archetypes and symbols that these famous psycho analysts explored. For example, if you were to look at a series of Brancusi sculptures in a chronological sequence, you can understand in some ways the generation and conception of his later works. In this sculpture from 1905, “Head of a Boy,” Brancusi is somewhat copying or emulating the style of Rodin in his portrait. If you recall Rodin worked with a kind of gestural and exaggerated quality in his sculpture’s. Rodin felt that it added meaning to his work especially when he would exaggerates features such as pose, and the sizes of things like hands and the depth of eyesockets. It is almost as if Rodin was being Impressionist in his bronze sculptures. Brancusi about three years later, makes his sculpture that he titles “Sleep,” in 1908. In some ways it looks like one of Rodin’s unfinished pieces and it depicts the head of a sleeping person. The head is pillowed in unfinished marble and you can see the chisel marks around the edges. The basic form of the head and the closed eyes, for Brancusi, is a distilling or boiling down of the idea of sleep. One of the important things to think about in terms of how sleep was perceived by about 1908 is that Freud’s theories concerning dreaming and Jung’s theories concerning the Gestalt and archetype of the human mind dealt with the idea that dreams word expression of the unconscious mind. Many of the Surrealists from that time believed that dreams could be used as inspiration for the creation of art. 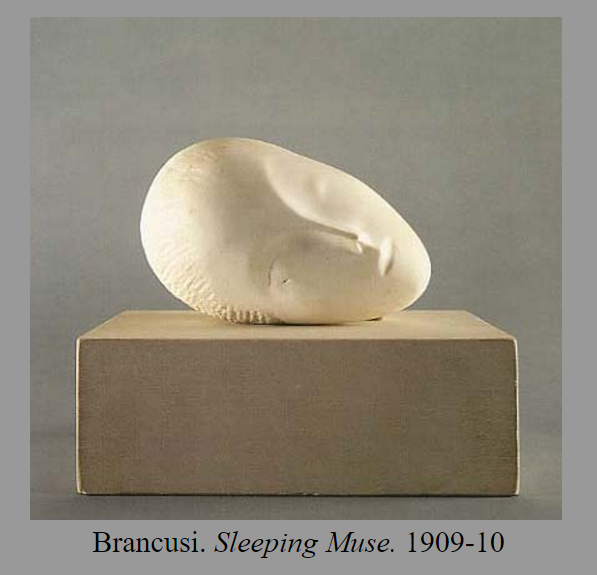 In 1909 to 1910 Brancusi interprets this concept of the dreaming mind being a type of “Muse” for creativity in his sculpture of the same title. Brancusi abbreviates the idea of his earlier work by creating an egg like form, with very simple forms that depict the bridge of the nose the eyes and the mouth. He places this egg like form on a simple block of stone. 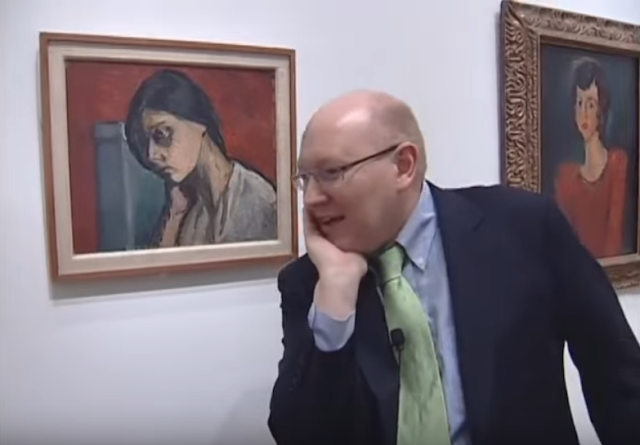 We can see the Genesis of two important ideas here in this work. The first being combining the idea of sleep with an egg like form, and coming up with the idea that the mind is like an egg that is about to catch. The second idea, is that Brancusi places this had or egg like Muse on a type of pillow which is also a type of column or platform is exhibited on. In 1915 Brancusi combines those ideas in another piece that is somewhat egg like, and if we interpret the egg as being a type of form that represents possibility, growth, and birth and his combination of this with the idea that newborn children also are like eggs in the way that they are going to grow up and become something else it makes sense. Brancusi further pairs down or abstracts down the forms of the newborn child by making the nose a single line that becomes both a line and crinkled eyes. The mouth is in ovoid like form that is concave and has a slight lift to the bottom of it which represents the lower lip of the open mouth screaming child. Five years after that, Brancusi combines all of his ideas in this sculpture titled “Beginning of the World,” in 1920. It looks almost like a shopping list of the main formal qualities we discussed earlier, mainly that of mix materials with pared down or stylized forms, as well as the concepts of Muses, eggs, sleep, dreaming, and potential. It’s not hard to interpret Brancusi sculptures because he clearly tells you what each one is and then you have to just understand how he would expect you to look at the form and interpret. Part of this is that he also knows and understands that most people looking at sculpture are highly visual and possibly also have a knowledge of art history. 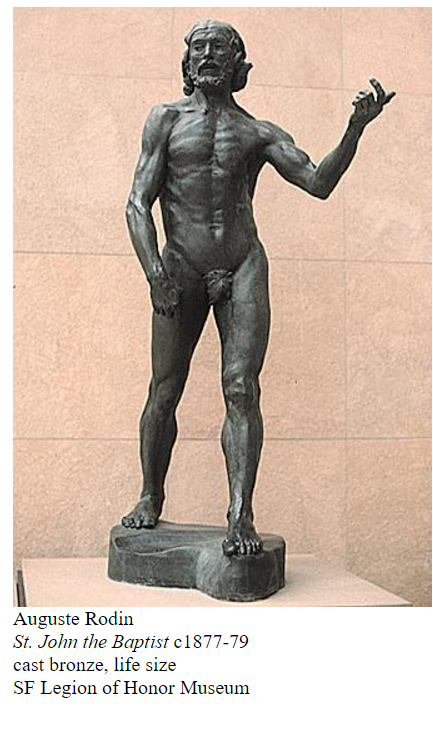 In his “Torso of a Young Man,” if you were to compare this against ancient Greek Kouros figures which look very much like modern abstract sculptures you can kind of see that he showing you the torso and legs of almost a fragment of sculpture. In some ways, he’s even copying some of the ideas of Rodin because Rodin also would take the arms and legs off of some of his sculptures and believed that was enough to express the full form. Both artists Rodin and Brancusi probably felt that this was a valid way of representing the human form because when one visits museums often they see ancient sculptures in fragments. Two interesting contextual ideas also will help you to understand Brancusi and his placement in the context of art history. The concept of a female being a Muse is particularly valid because Brancusi had a relationship with a woman named Mme. Pogany was also a artist and connoisseur of fine art. 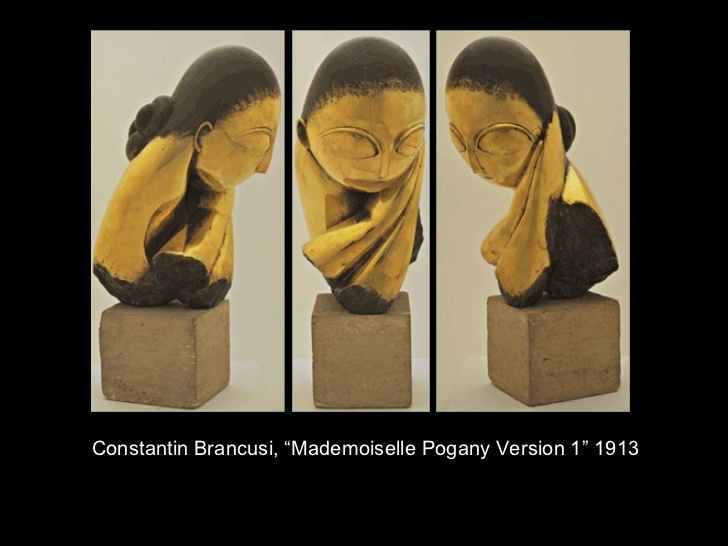 His sculpture ties these ideas together, Mademoiselle Pogany is both the subject and inspiration of a series of sculptures that represent her using the symbolic vocabulary that Brancusi developed. 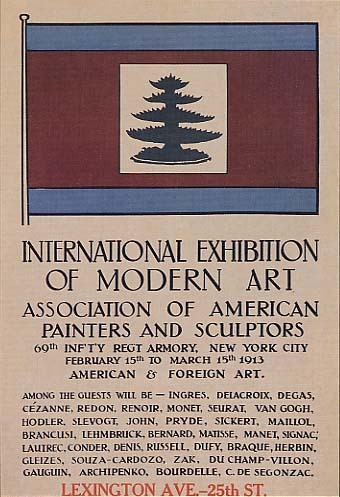 Probably another important contextual element, is that one of the things that kind of helped Americans to become aware of Brancusi’s work as well as many of the Impressionists and the Ashcan School of art, was the Armory show of 1913. A large show given in a converted warehouse for ammunition, the show introduced New Yorkers to the new avant-garde artists of Europe as well as the United States. This Armory show also led to the beginnings of New York being the new center of the art world at the beginning of the 20th century.